Red Hood will be part of the Batman Arkham Knight. In a new story campaign this much loved or much hated member of the Batman mythology is somewhere in Gotham. 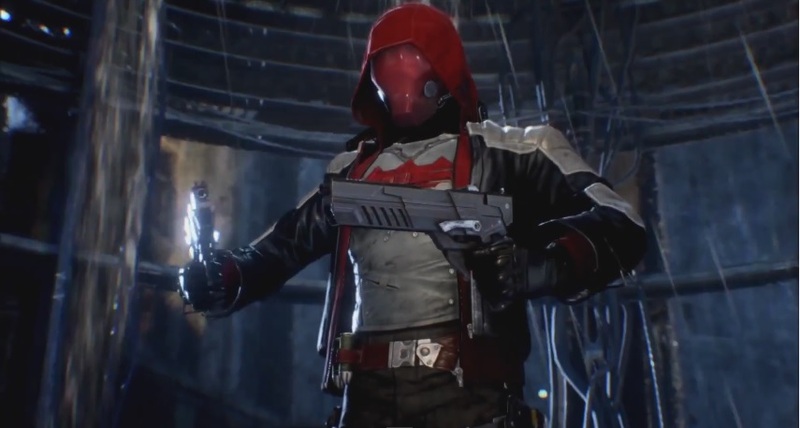 The big difference is that Red Hood is not afraid of guns and the trailer show that it will be a huge part of his weapons of choice. The DLC will be free exclusive content only for gamers who pre-order Arkham Knight through GameStop, EB Games or Games. Everybody else will be able to get the Red Hood DLC too but you will have to buy it. Batman Arkham Knight is going to be the biggest Arkham Game ever and is rumored to be the last one in this storyline. Earlier in 2015 The “Gotham is Mine” trailer was released show all of the villains teaming up to with one purpose, take out the bat. 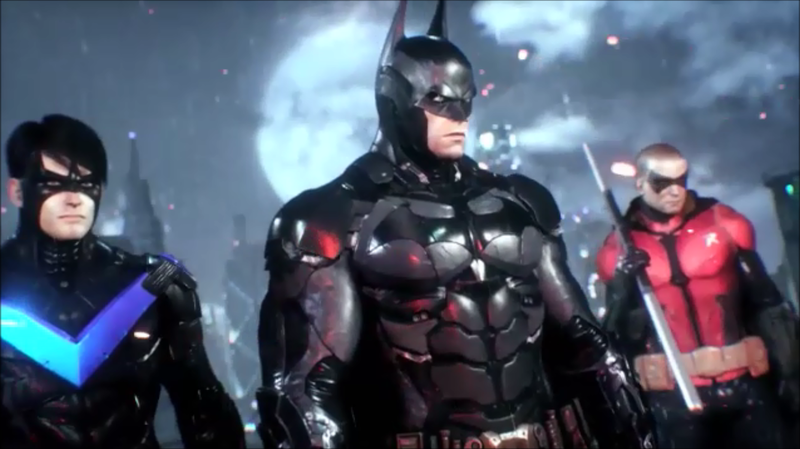 The "All Who Follow You" trailer shows that Batman has backup and it everybody gamers want to see. Nightwing, Robin, Catwoman and the previous announced Oracle will all be there trying to stop Scarecrow and the Arkham Knight. Arkham Knight has been delayed once more. It was going to be released in October 2014 but it was pushed back to June 2, 2015. Now, it will be released on June 23, 2015. A small delay but having this announcement come out a few days after rumors started to show up the Batman Arkham Asylum and Arkham City are both getting a update for Xbox One and the PS4 might have something to do with the delay. It’s not all bad news, a new actual footage of seven plus minute’s gameplay trailers has also been released. It really shows off the freedom of flying around the city and how fast the combat is in the new game. You also get gameplay of the new Batmobile and when you see the interrogate sequences you will get a better understanding why this game is Rated M for Mature or PEGI 18 depending on where you live. In the “Gotham is Mine” trailer it looks like Scarecrow is the one leading the march against Batman and the Arkham Knight is his hired muscle. Not only are the two of them set to take on Batman they are gathering up anybody who wants to put an end to the Dark Knight and the Gotham police also. The trailer does confirm that this time the game will be rated M for Mature unlike the other four games in the series. The previous games were all rated T for Teen. We will have to wait till June to finally find out who is the Arkham Knight and was is the problem with Batman, or is the issue with Bruce Wayne? We finally have got a look at how the Batman Arkham series will look on the Xbox One and the PS4 in this released trailer. But, most importantly they gave us a full look at the new Batmobile and it looks like Oracle aka Batgirl aka Barbara Gordon will have a larger role is the storyline! Rocksteady and WB games has announced that the Batman Arkham series in heading to the PS4 and the Xbox One as next gen title. You will also be able to download a digital copy from both Xbox Live and PSN but only on your Xbox One or PS4. Batman Arkham Knight takes place one year after Arkham City and it is set on three islands in Gotham. The game is also going to be five times larger than Batman Arkham City. We know that Two Face, Penguin, Scarecrow and Harley Quinn are in the game but Rocksteady is working with DC to introduce a new villain as Batman’s main foe. The other major new edition is the introduction of the Batmobile as a large part of the game. We don’t think we have ever seen Gotham, Harley Quinn and Batman look so good. The sad news is that is going to be the final game in the series, the good is that it is scheduled to be released at the end of 2014.